How to describe Happy Tree Friends to the uninitiated few (all two of you)? Think of the cutest, cuddliest little woodland creatures frolicking and enjoying themselves, going about their daily lives being cute gone completely wrong. A series of animated shorts that was initially an internet phenomenon, Happy Tree Friends is now a full-blown franchise with t-shirts and annoying TV spots and toys. DVDs of the series are available, or you can check out the original official website to see some of the shorts. Warning: Very violent and graphic, in an "animated cute cuddly animals getting slaughtered" kind of way! The toys have been out for a while now, first two adorable rip-their-heads-off plush toys of Cuddles and Flippy, and then a series of action figures: a normal series of toys, featuring many of the most popular characters with bases, and then a deluxe series of two-packs including one of the normal figures alongside a slaughtered/dismembered version of the character, plus some accessories. 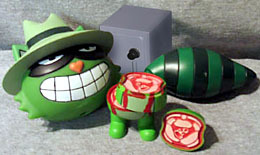 For instance, Shifty, the kleptomaniac raccoon brother of Lifty and master of the five-finger discount, from the deluxe series which is currently marked down in Hot Topics across America - get in now! These figures look fantastic, fitting alongside Palisades' magnificent Invader Zim figures as a showcase for how to do animated characters right. Shifty is Shifty, identical to his animated self, that nasty little one who sabotages races, tries to hurt others, and usually ends up crippled. Standing 4" tall, the sculpt is great, not overly detailed but dead-on (snicker) and with paint that's simple but complimentary. The maimed-Shifty reaches the same high standard but with slightly more detail on the blood and insides, which look fantastic. The only complaint is minor: whilst Maimed-Shifty comes to pieces easily and fits back together, he's missing arms, probably suggesting a buzzsaw accident, but weird because the arms on normal-Shifty detach and there are indents in both bodies where they fit; if it weren't for these missing, you'd have two complete Shifties - instead, you have normal Shifty and Unarmed Buzzsaw Accident Shifty. They could have easily made this a two-pack of Lifty and Shifty together, especially since he doesn't even get a "pained" head like the others do. 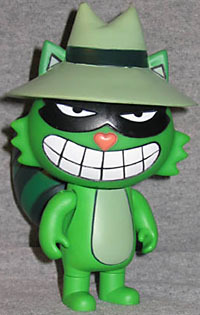 Technically sort-of a small figure, Shifty has plenty of play and movement in him despite his small size and stature. Shifty has balljointed shoulders, then a jointed neck and upper legs; it doesn't sound like much, but you can move him around and play with him. Based on the character design, there's not many other places you could have him articulated without threatening to ruin the sculpt. Then there's the immensely fun Maimed-Shifty, who's lots of fun to play with - coming apart into five pieces, he's got three big cuts in his body and his tail comes right off, and dismembering him is such fun! The pieces fit together for display, but then he comes right to pieces with the throw of some action-figure blades, like getting Legolas to shoot arrows at him, or shooting him with your old TMNT Pizza Thrower. Possibilities are endless and such fun to be had! The Maimed-Shifty is technically an accessory, but there are also two other goodies: first, a Happy Tree Friends grassy knoll base, with two pegs to fit and display either of your Shifties on. Secondly, he features a safe, perfect for dropping on him or throwing at him, as seen in his animated escapades. Both nicely detailed and very suitable, it makes the complete package. 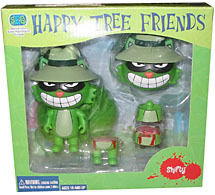 Each deluxe figure comes in an attractive box with lovely Happy Tree Friends style art all over, a clear window at the front displaying both Happy Tree Friend and their mutilated doppleganger. It's a very nice little package for both openers and MIBers; the only thing missing is some pictures of the others in the line on the back. This is no doubt a fun little set. I appreciate both the fun and the inventiveness making these toys - having a dismembered toy to go with the normal toy is a great idea, especially when they can be slaughtered so easily! The only drawback is the price; these normally set you back around $20 and picking up the set won't be cheap. They did manage to reach clearance (about $4) in some places, but that was long ago. 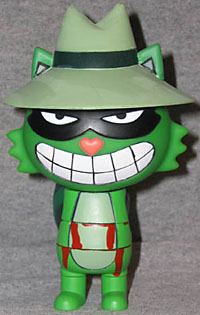 Now that the online Happy Tree Friends store has stopped selling them, basically the only place to find them is eBay, and that probably wont be cheap - otherwise, these are great figures and great fun. Just not for the kids. No. Have you ever stolen anything? Tell us on our message board, the Loafing Lounge.